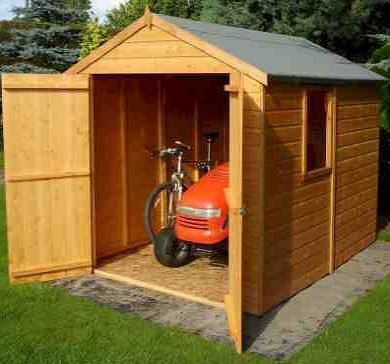 The Shire Warwick is a very traditional looking storage shed and it comes in a modular design for easy handling. Its exterior is manufactured from strong tongue and groove Shiplap cladding, while OSB materials have been used on the interior to keep costs down. An apex roof provides extraordinary weather resistance, whilst also boosting the interior height. As the shed is constructed with an OSB floor, it isn’t suitable for heavy storage. You could add another sheet of wood to improve its strength, but you will need a few DIY skills to do this. The opening glass window is one of the highlights of the shed. As it comes with interchangeable sides, you can install this window on the left or the right of the building. As it can be opened you will also benefit from excellent ventilation which can come in really useful in the summer months. Wide double doors located at the front of the building provide fantastic access. They come with a fitted pad bolt which enables you to properly secure the doors with a padlock. As the shed doesn’t come with a padlock included, you will need to buy one separately. 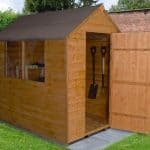 Shed Store have added a basecoat treatment to the materials, but it is advised you apply your own treatment after assembly and then every year afterwards. Only comes with OSB floor. This means it isn’t suitable for heavyweight storage. 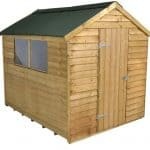 The Warwick storage shed is part of the Shire collection and it offers a traditional design that will blend in with any garden. What’s interesting here is that Shed Store don’t provide any measurements for the doors. You can see from the picture that the double doors do have a very wide design. However, they do appear to be a little on the short side. So if you’re quite tall, it is likely you will need to duck down in order to enter and exit the shed. Inside however you do have a comfortable level of head height due to the great apex roof. The apex roof of the Shire Warwick shed gives it a very traditional look. It isn’t just aesthetic benefits that this roof style provides. It is one of the best weather-resistant roofs out there; ensuring even heavy downpours don’t stand a chance at settling on top of the building. Whilst it is covered by a fairly weak felt, this could be upgraded to provide additional water resistance. Then there’s not forgetting the interior height that an apex roof provides. Apex style sheds are incredibly comfortable to walk around in. Unfortunately both the roof and the floor are manufactured from OSB materials. This is very similar to chipboard and it is used because it is cheaper. 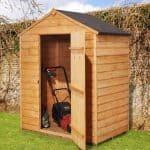 So whilst the exterior of this shed benefits from a superb quality, the interior is definitely in need of improvement if you want to store anything of significant weight. We’d suggest adding a thicker wooden board on top of the OSB floor to provide additional stability and strength. 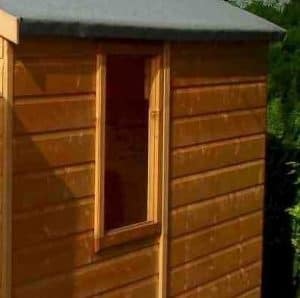 The cladding is the highest quality you will find on any storage shed. Shiplap tongue and groove measuring 12mm thick is used to create an interlocking, draft and water resistant building. There’s even a little channel that is situated between each plank, directing rainfall off the walls and onto the floor. What’s great about this style of cladding is that it is also less likely to warp throughout the seasons. This means you don’t have to worry about where you assemble it. What is unique about this model is that it doesn’t stick to a standard frame. Instead it makes use of a thicker, more rigid 34mm x 34mm framing. A basecoat treatment has been added to the timber which will protect it against any potential damage which could occur during transit. However, another treatment will need to be added after assembly and then annually to maintain its great weather resistance. Very wide double doors open out to reveal an exceptional level of space to manoeuvre even the bulkiest of tools, equipment and machinery. We’re not surprised to see that they haven’t been braced as a lot of the design has been built with cost saving in mind. It is good to see that a stronger than average pad bolt has been used to keep the doors secure however. One tall window is included and can be installed on either side of the shed. As you can see in the photo, the window benefits from an aesthetically pleasing frame to accentuate it and create a great focal point. Horticultural glass has been used for the glazing which is slightly thicker than styrene, but it isn’t shatterproof. So care will need to be taken if you have pets or children. Whilst we are pleased to see a strong pad bolt added to the doors, we would have expected a padlock to be included so you can keep the building locked. Instead you will need to buy one separately if you want to make sure your storage is safe from thieves. As there is just one window, there is some level of privacy included, but it is still possible to view the contents of the shed from the outside. If your garden is closed off this might not be a major concern, but if not we would advise installing curtains. 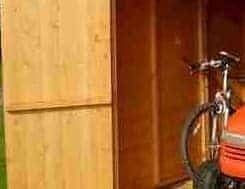 The only thing you can customise on this shed is the window placement. It can be installed on the left or right side which can aid with privacy and give you more choices in terms of where to assemble the shed. You’ll be forgiven for being more than a little disappointed by the extra options available with this shed. Whilst it is a high quality building, there are certain things that can definitely be improved and upgraded. The pad bolt on the doors is a great addition, but as a padlock isn’t supplied we’d at least have liked to have seen one on offer as an extra. 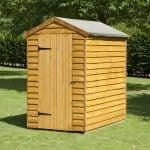 However, the only extra Shed Store offer with this shed is a wooden base with adjustable spikes. A solid base is vital when assembling a shed as it aids in stability as well as protection against the elements. Concrete or paving slabs are the preferred base for an outdoor building. However, when this isn’t an option the wooden base provided here could be a fantastic alternative. The adjustable spikes are a nice touch and will help to make sure the base is anchored deeply into the ground; providing a lot more stability in strong winds. We have mixed feelings regarding the quality of this shed. The exterior is outstanding. Shiplap tongue and groove walls give it a superb quality. The interior floor and roof however is made from cheaper, weaker materials. If you’re just looking at storing light equipment and tools this won’t be an issue but it does bring the quality down a little. 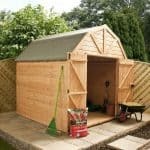 This falls slightly short of the most popular 8’x6’ storage sheds, though you still benefit from a good deal of storage space with this model. Bicycles, general tools and equipment and even light lawnmowers can easily fit into this building. Full instructions for assembly are provided and it will likely take from 2-4 hours. You shouldn’t come across any problems, though as with most sheds it is recommended two people put this together rather than one. For the cost you are getting a good value shed. You will need to spend a little extra on things like a padlock and a stronger floor if heavyweight storage is required. Final Thoughts: With its traditional, rigid design, the Shire Warwick apex double door shed provides plenty of interior storage space. It has a tall design making it possible to store tools and equipment such as rakes, fishing poles and brooms. As the floor is only created from a chipboard style OSB material, it isn’t suitable for anything heavy. What we do like is the opening glass window. This isn’t as safe as styrene glazing however so if you have young children or pets this is something you will need to consider. The wide double doors allow excellent entry into the building and are fitted with a strong pad bolt which you can easily lock if you buy a good quality padlock.